The homestretch is upon us. 3 weeks for the rest of your life. Well, the rest of your fantasy season at least. You need this 69 right now, more than ever. 69 things I took away from Week 10. Tyron Smith was the Cowboys MVP, not Ezekiel Elliott. Those expecting automatic RB1 numbers from Alfred Morris will have to wait a few weeks. The Eagles come off their bye for a big-time Sunday Night Football Game at Dallas. Alshon Jeffery has 19 targets and 3 TDs in his last 2 games. Jay Ajayi could have a big game against the Cowboys Defense. Sterling Shepard is averaging over 100 yards and 11 targets in his past 2 games since coming back from injury. Evan Engram now has at least 4 catches and a TD in 4 straight games. Samaje Perine will be a hot pick up this week. The RB to own is still Chris Thompson. Kirk Cousins should have to throw a ton against New Orleans. Jamison Crowder has seen 24 targets the past 2 games. The entire Buffalo Offense had a game to forget against the Saints. Tyrod Taylor has been benched for Nathan Peterman. That’s Bold Cotton, let’s see if it pays off. The guy to pick up on the wire is Kenyan Drake if he is still available. Jarvis Landry now has tied his career high for receiving TDs with 5. He has scored them all in his last 6 games. Julius Thomas has TDs in each of the last 2 games. Robby Anderson has become a must-start every week with 4 TDs in his last 4 games. Few players have failed to live up to their preseason hype like Bilal Powell. He has always been a fine player but he just isn’t cut out to carry the load. The Patriots are going to use Rex Burkhead a lot down the stretch. Dion Lewis has completely taken over the Mike Gillislee role. Brandin Cooks is quietly putting together a solid 1000 yard season. The Bears finally let Mitch Trubisky throw the ball around and he looked pretty good doing. When he gets NFL WRs he may be pretty good. Jordan Howard is too good to throw up a stinker like he did against Green Bay. The Lions have become one of the best Pass Offenses in the league over the past month. Ameer Abdullah has scored in each of the past 2 games. Golden Tate had yet another big game against the Browns. There is no doubt that Davante Adams is the Packers WR1 going forward. Jamal Williams will be the top waiver wire pick up this week. Adam Thielen is a WR to target in your draft every year. He will always get drafted a round or 2 later than he should. Latavius Murray has looked like the better RB in Minnesota the past few weeks. Before everybody gets excited about Teddy Bridgewater, take a look at his stats from 2015. He’s a game manager. The Ravens come off by to face the Packers. Not a lot to say about them. Andy Dalton and AJ Green had a very good game against the Titans. Joe Mixon is still doing nothing but he did score another TD last week. While he has 4 TDs to 12 INTs Deshone Kizer has actually been a fantasy QB1 4 times this season. Isaiah Crowell seems to be gaining momentum. Juju Smith-Schuster could be a league winner. He now has a TD in each of his last 3 games. Le’veon Bell has a big second half ahead of him. The Falcons dominated the Cowboys but nobody really went off for Atlanta. Tevin Coleman would be an every week start if Devonta Freeman misses time. When Cam Newton is on his game he’s maybe the best QB in all of Fantasy Football. Devin Funchess is making me eat my words. He is the Panthers clear WR1. I was also wrong on Christian McCaffery. The Panthers are using him much better over the past month. The Saints have a Good Defense, Two top 10 Fantasy RBs, and Drew Brees is hard to start right now. What is going on? Michael Thomas is having a good season but the TDs aren’t there. He was such a great red zone threat last year. Not a ton to say about Tampa Bay. Doug Martin is getting the volume but he just isn’t producing. Another Tom Savage start, another big outing from DeAndre Hopkins. Lamar Miller is not that exciting but he does have a decent floor. Jacoby Brissett has been really steady the past month. TY Hilton has 3 games over 150 yards receiving and 7 games under 60 yards. Marqise Lee has almost 40 targets in his last 4 games. I have no idea why Doug Marrone stopped running Fournette last week but had Blake Bortles throw the ball 51 times. That was a huge game outta nowhere by DeMarco Murray. The upside just isn’t there with Marcus Mariota right now. Larry Fitzgerald is building on his legend every week. Jermaine Gresham has a TD in each of the 2 games Drew Stanton has started. Robert Woods is on one right now. Jared Goff and the Pass Offense seems to be getting better every week. The Vikings are allowing the fewest fantasy points to Running Backs but you will start Todd Gurley if you have him. Matt Breida seems like he can play. Hyde should be gone next year but a younger better RB may be there. Seattle’s offense is pretty much the opposite of New Orleans. All passing. Russell Wilson can be streaky but he is without a doubt a top fantasy option this year. While Brock Osweiler is clearly not a good QB, he does make Demaryius Thomas and Emmanuel Sanders easier to start. Kansas City being on a bye last week crippled a lot of fantasy squads. Kareem Hunt is in a good spot to bounce back. Austin Ekeler seems like he has taken over the classic passing back role that Danny Woodhead and Darren Sproles held before him. Keenan Allen hasn’t been touching his ceiling but in this slow year for WRs his floor is still ok as long as you have a few WRs outperforming him. The Raiders may have the best shot at overtaking the Bills for the 6 seed in the AFC. The Raiders come off the bye for a Fantasy “All You Can Eat” Showdown with the Patriots in Mexico City. That’s this weeks 69. I’ll catch you next week for Turkey Day. 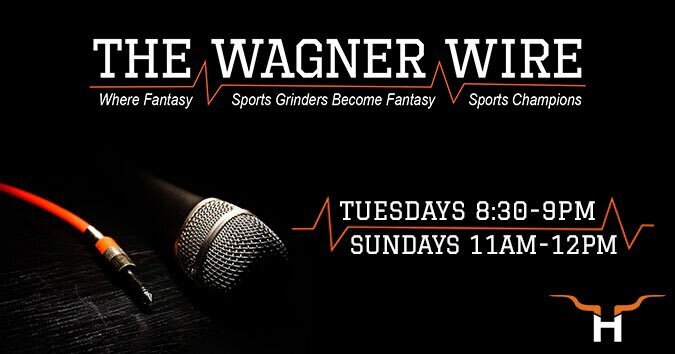 Don’t forget to listen to The Wagner Wire Live on Tuesday’s at 9:30 PM EST where I drop my 6 to 9 things you should know and listen Sundays at Noon EST for the big show with top guests from the Fantasy Industry. Stream it live on hornfm.com or the 104.9 The Horn App.